Sunday I spend some time looking back through our photos from Utah, Nevada and Arizona. I have so many that I have not posted yet. I think I need to find a way to share them in bulk, at least the ones I have not shared yet. I plan to look into that. Of all the places we visited, I think this was my favorite view. 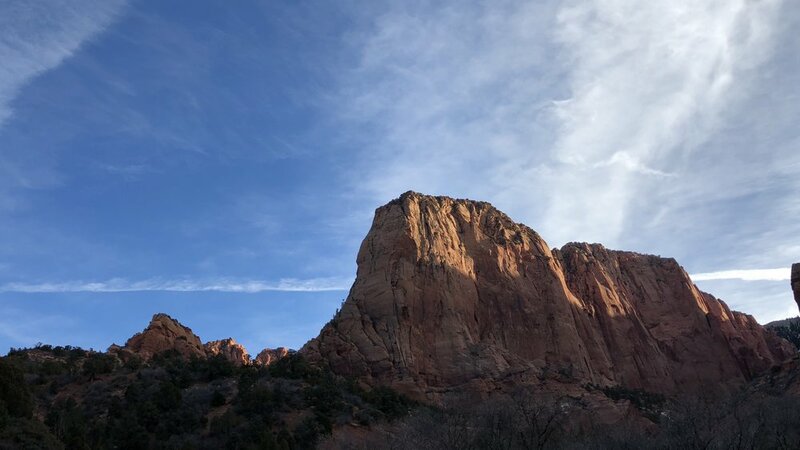 Kolob Canyons is just stunning. It’s right off of I-15, just a few minutes north of St George, Utah. If your ever in the area I recommend you stop and visit. You have to pay for a National Park Pass, but it’s good for a week. Of course, next week, I will be looking at photos, and likely conclude that some other location is my favorite. That is the nature photographers dilemma .. candy in a candy store. View from the scenic overlook at the peak of the drive ... feeling some OMG here. I enjoyed the view. Go see it!! Teresa took this photo not to long after we left Zion National Park. I loved the colors they used, and found the ‘undertaker’ builiding to be a bit odd. Clearly, they didn’t want anyone walking around. On the first day in Utah of this past trip, we stopped to photograph the sunrise. The temperature was in the lower 40s. We had spent the night in St George, and we off on our journey. The morning was crisp and we were excited for the sun to rise over the mountains. When it did, I captured this photo of these two fishing. Sometimes the simple things bring the most calm. I can image fishing here. It looks so relaxing and peaceful. I have never been good at taking time to relax. I have done more of that in the last month than in years (except for our vacation to Hawaii two years ago). I have to say, I am feeling so much better, and stress free. Take a little time to let the stress go ... perhaps go fishing in the mountains.